Daksh Misbehaved To Anika In Dark,Anika Curses Shivaay For Breaking Her Phone Ishqbaaaz SBAS 29th June Video and Written Update. 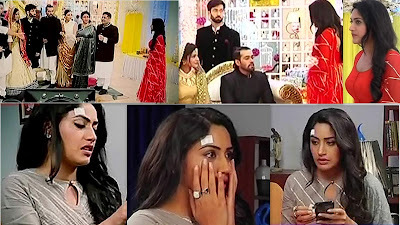 Segment Start with Anika Who is Doing Priyanka’s Makeup Before Shivaay comes to Meet his Sister Gets Surprised to See Shivaay In tears and Seeing Him In Tears She too gets Tears In Her Eyes. Shivaay Takes Priyanka to Hall With Omkara-Rudra and She goes and Sit with Daskh after the Ceremony Rudra takes Selfie and Suddenly Shivaay Grips Daksh’s Hand and Daksh Let out a Painful voice and Priyanka See Her Name’s Tatto She Gets Emotional. Shivaay to get Emotional for Priyanka while Seeing All this But Daksh who was Hesitating to come in front of Anika Hiding here and There Because He was the One who Misbehaved with Anika Last Night In Dark Room. Because of Darkness Anika couldn’t See His Face that’s why She doesn’t recognize him in the Ceremony and Daskh is Worried what if She recognizes him and that means No Marriage and Shivaay won’t leave her SO He plays his Plan and Shows His Tatto to Priyanka that How Much He Loves her. Another Scene Where Anika is Cursing Shivaay Because He Has Broken Her Phone and She has Only This Phone Not so much Money to Buy New Phone.